Most investors have heard of the January Effect which is the observation that January has historically been the best month to be invested in stocks. This year was particularly good with Canadian and U.S. markets up 8.7% and 8.0% respectively. 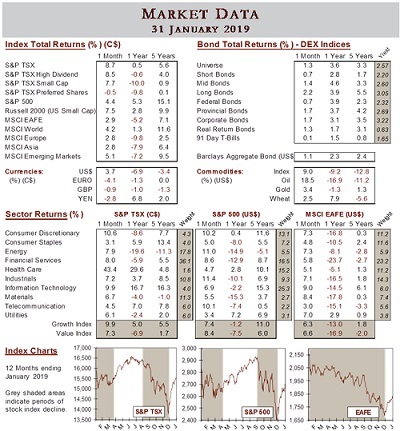 However, there is another January effect which states that, “as goes January, so goes the year.” To find out if this effect was equally applicable to Canada we looked at 51 years of monthly equity market returns (excluding dividends) from 1968 to 2018 for the S&P/TSX as well as the S&P 500. What we initially found striking is that when January had a positive return, that month’s returns were well above average relative to the other months of the year. 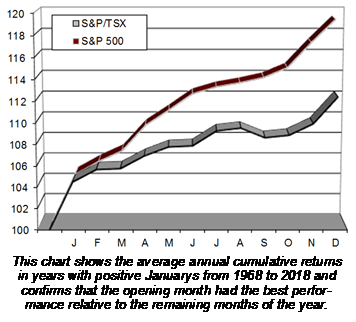 For example, of the 31 Januarys with positive performance, the S&P/TSX was up an average of 4.3%. The next best performing month in those years, as can be seen in the table to the left, was December which returned half that amount at 2.0%. Similarly, in the U.S., the 30 Januarys with positive performance were up an average of 4.3% while the next best month was April with a 2.0% gain. The chart below depicts the average annual cumulative returns and it clearly shows that the opening month has the best performance relative to the remaining months. We then looked at how these markets performed for the full year. In those years where January was positive, the S&P/TSX (including dividends) returned 12.4% versus an average of 10.1% for all 51 years reviewed; a 23% improvement. The S&P 500 (including dividends) returned 19.2% versus an average of 11.2%, or 71% better. These numbers confirm that, “as goes January, so goes the year” translating into above average annual performance in those years. The most widely accepted explanation for the January Effect is tax-loss selling. The tax circumstances of taxable investors are often more important than a security’s fundamental valuation, as such investors will sell whatever securities are required at the end of the calendar year to establish capital losses for income tax purposes and then repurchase the shares after a prescribed waiting period. As the waiting period often expires early in the next year, the repurchase orders flood the market in January, hence creating abnormal returns in the month. In addition to tax issues, researchers have also suggested other reasons for the January effect. One is “window-dressing” as portfolio managers unload their embarrassing stocks at year-end so that they don’t appear on their annual report, and then redeploy the proceeds in January. Another reason, which we may see more of in 2019, is short sellers covering their successful short positions early in the next year so they usually do not have to pay taxes on the gains until April of the following year. Whatever the explanation, it is clear that investors should not be out of the market if January is a good month because the returns over the rest of the year tends to be positive, though not necessarily as robust. Of course, one must always bear in mind that past performance does not mean this trend will continue. The debate over the January effect will no doubt continue for many years to come and it will be interesting to see how it plays out in 2019, especially after the strong start to the year.